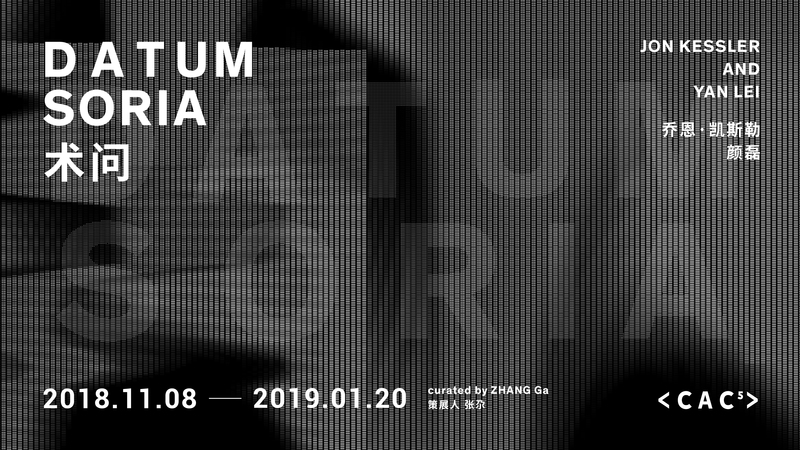 Chronus Art Center is pleased to present the much-anticipated presentation of Datumsoria: An Exhibition of LIU Xiaodong, Carsten Nicolai, and Nam June Paik. A neologism, Datumsoria conjugates datum and sensoria, denoting a new perceptual space immanent to the information age. 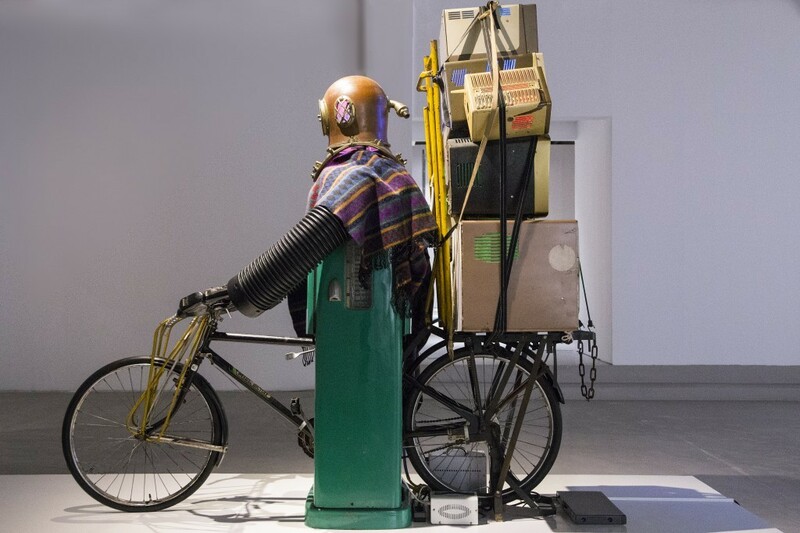 Upon entering the gallery, the audience is first greeted by a Genghis Khan of the 20th century transformed in a tongue-in-cheek fashion by Nam June Paik to amusingly pedal a bicycle rather than majestically command from horseback. Topped by a diving helmet, the prince’s torso is a patchwork made from a fuel dispenser conjoined with plastic pipe limbs. Loaded in the back of his overburdened vehicle is a pile of television cases stacked on top of each other encasing symbols, characters made of neon lights, intimating the transmission of encrypted messages through an electronic pathway. A screen that is embedded inside a hollowed-out part of the fuel-dispenser displays video images that morph from mundane objects to a pyramid of ancient glory. Created in 1993, the year when the first graphic web browser Mosaic was launched making the long-promised information superhighway a material reality, Rehabilitation of Genghis-Khan intuitively resonated with the coming of a new historical epoch in which the entire human experience would soon be transformed by the instantaneity and simultaneity of network immediacy, the gargantuanization of processing power and the nanonization of storage media. Surrounding this Quixotic caricature unfolds the monumental installation Weight of Insomnia. Working closely with a group of technologists over a period of one and a half years, the work is LIU Xiaodong’s latest daredevil endeavor venturing into an unfamiliar zone of telematics and computer vision-engendered automation systems. Pushing boundaries of his documentary style of live painting, the artist completely reinvents himself by penetrating into the digital now. Three locations were carefully identified and equipped with video cameras: one near the iconic Bund in Shanghai where humans, cars, buses and bicycles vie with each other to cross street, another monitors the Apple Store in Beijing’s fashionable Sanlitun district where urban sophisticates rub shoulders with novices from the provinces, and a final camera watches a public plaza in the artist’s home town. At dawn or at dusk, the plaza is often enlivened by troupes of elderly people dancing to disco rhymes with a definitively folkloric twist for an aerobic drill. Three large-scale canvases, each 3 x 2.5 meters, are mounted on crude construction scaffolds. 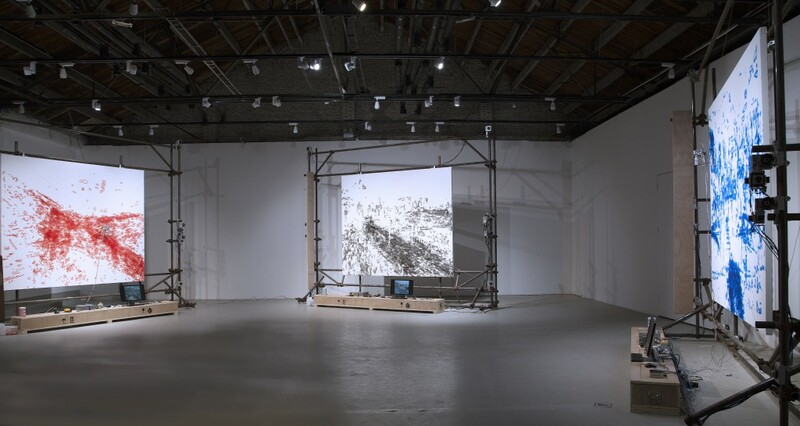 A robotically controlled paintbrush jitteringly translates the three discrete, incoming datum captured by the video cameras into contours of buildings, silhouettes of trees, outlines of vehicles, and shadows of human figures. If the canon of live painting is to arrest a fleeing second, to fixate a bygone moment for a rumination on signification, then what LIU Xiaodong’s canvases depict are a multiplicity of instants that are forever fluctuating, generating at each moment a new sediment of emotional residue, overlapped, juxtaposed, concatenated and truncated. It is as if the artist, reincarnated in a robotic consciousness, wrestles through an endless, restless insomnia to piece together an ever-evolving jigsaw of amorphous desires and anxieties, fleeting nightmares and ruptures. LIU Xiaodong thus constructs a new awareness of contemporaneity. In so doing, the artist not only re-assesses painting in the age of internet and algorithm but also makes apparent a new reality that situates itself in the materiality of media informed by data fluxes. 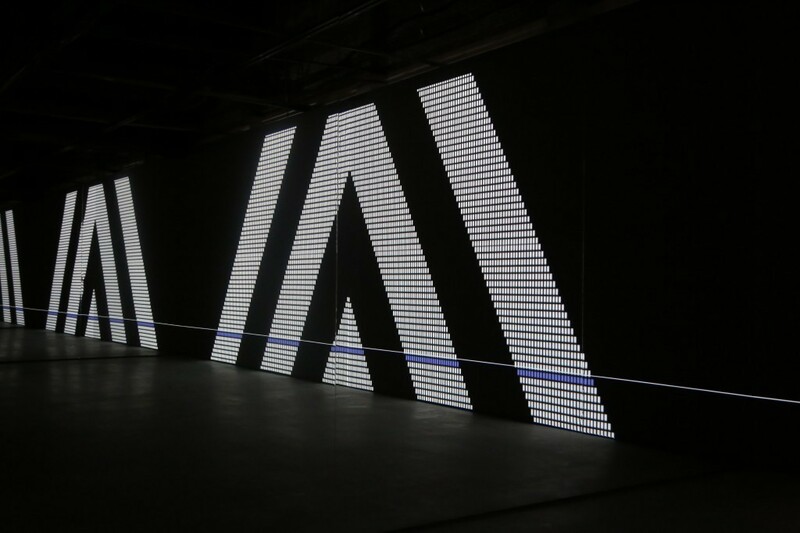 In contrast to the topsy-turvy fabrication of a pictorial sensibility through live-streamed data as evidenced in Weight of Insomnia, Carsten Nicolai’s installation unitape offers an examination of perception on graphic structures that resemble punch cards of the early computing era. If LIU Xiaodong’s gradual abstraction of live streaming data is the result of the additive entropy of real world uncertainty, Nicolai’s immaculate images and sounds are pure mathematical precision that illuminate an algorithmic sublime. Series of patterns and endless permutations reminiscent of code-scanning reverberate with generative sounds. Here repetition creates difference and difference engenders unison that is charged with psychic force as well as pictorial finesse. The materiality of the generative data is manifested by the very projection medium and heightened in the mirrors flanking the projection screen to both sides, extending the field of imagery in infinite depth and breadth while the sonic cadence echoes reverberatingly to create a totality of sensory immersion. unitape borrows its inspiration from the artist's involvement with the history of the city of Chemnitz, once one of the most important locations of the German textile industry. Inspired by the invention of the mechanical loom by Joseph-Marie Jacquard (1752–1834) which enabled the swift production of complex patterned fabrics using the principle of automated control by punch cards, Nicolai’s unitape reflects on communication processes in the industrial era while at the same time addressing issues related to the socio-psychological aspects of the interaction between man and machine. Datumsoria is the first edition of a series of exhibitions under the auspices of the Art & Technology @ project conceived and curated by ZHANG Ga. Co-presented by Chronus Art Center, ZKM | Center for Art and Media, and the Nam June Paik Art Center, the exhibition will travel to ZKM in Karlsruhe, Germany in 2017 and other destinations. 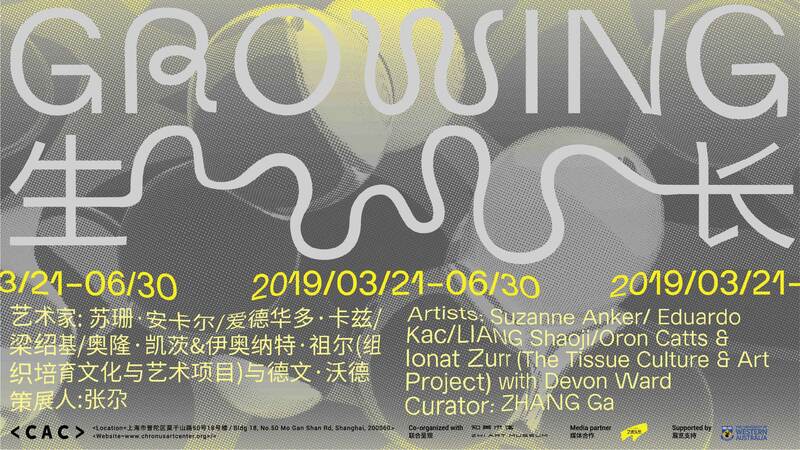 Weight of Insomnia is commissioned by Chronus Art Center and supported by Lisson Gallery and Beijing ZONHOM Cultural Development Co., Ltd. Galerie EIGEN+ART, Berlin has provided generous support for facilitating the realization of unitape. On the occasion of the opening, the artists Carsten Nicolai and LIU Xiaodong will be joined by ZKM curator Philipp Ziegler and Jinsuk Suh, director of Nam June Paik Art Center, for a panel discussion. 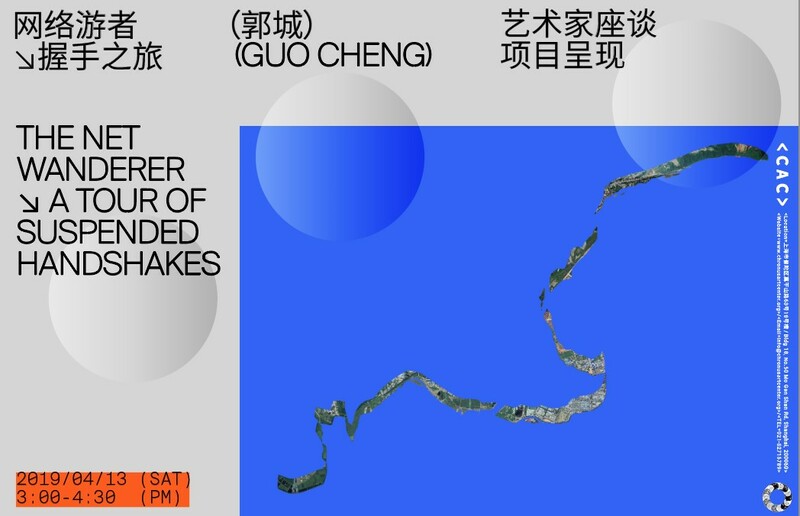 The panel will be moderated by ZHANG Ga, curator of the exhibition and artistic director of Chronus Art Center. As part of the public program associated with the exhibition, MIT professor, art historian Caroline A. Jones will deliver a lecture titled “Energy / Entropy --- Art, Autonomy, Information” on Sunday, September 18th. LIU Xiaodong is a painter of modern life, whose large-scale works serve as a kind of history painting for the emerging world. LIU locates the human dimension to such global issues as population displacement, environmental crisis and economic upheaval, but through carefully orchestrated compositions, he walks the line between artifice and reality. A leading figure among the Chinese Neo-Realist painters to emerge in the 1990s, his adherence to figurative painting amounts to a conceptual stance within a contemporary art context where photographic media dominate. His undertaking ‘to see people as they really are’ was galvanized in the turbulent years of the 1980s and, alert to the legacy of Chinese Socialist Realism, his compositions are painted with loose, casual brushstrokes and layered with meaning. While he works from life and often en plein air, he chooses sitters to supply ancillary narratives to landscapes or situations. This participatory dimension to his practice, where projects are also documented by diaries and films, reflects an urgent sense of interconnection: ‘Society and art’, he says, ‘should be like breathing – one breathes in and the other breathes out’ (2008). Liu Xiaodong lives and works in Beijing but has undertaken projects in Tibet, Japan, Italy, the UK, Cuba and Austria, and closer to home, in Jincheng, in the north-eastern province of Liaoning, China, where he was born in 1963. He has a BFA and an MFA in painting from the Central Academy of Fine Arts, Beijing (1988, 1995), where he now holds tenure as professor. He continued his studies at the Academy of Fine Arts, University of Complutense, Madrid (1998–99). His work has been the subject of numerous solo exhibitions at venues including the Faurschou Foundation, Copenhagen, Denmark (2016); Palazzo Strozzi (2016); Fondazione Giorgio Cini, Venice (2015); Shao Zhong Foundation Art Museum, Guangzhou, China, Minsgheng Museum, Shanghai, China (2014); Seattle Art Museum, WA, USA and Today Art museum, Beijing, China (2013); Kunsthaus Graz, Austria and Xinjiang Arts Centre, Urumqi, China (2012) and Ullens Center for Contemporary Art, Beijing, Cguba (2010). His work has also been included in numerous group exhibitions, such as the Shanghai Biennale (2000,2010), the 15th biennale of Sydney (2006) and the 47th Venice Biennale (1997). Born 1965 in Karl-Marx-Stadt, Carsten Nicolai is a German artist and musician based in Berlin. He is part of an artist generation who works intensively in the transitional area between music, art and science. In his work he seeks to overcome the separation of the sensory perceptions of man by making scientific phenomena like sound and light frequencies perceivable for both eyes and ears. Influenced by scientific reference systems, Nicolai often engages mathematic patterns such as grids and codes, as well as error, random and self-organizing structures. His installations have a minimalistic aesthetic that by its elegance and consistency is highly intriguing. After his participation in important international exhibitions like Documenta x and the 49th and 50th Venice Biennale, Nicolai’s works were shown worldwide in extensive solo and group exhibitions. His artistic œuvre echoes in his work as a musician. For his musical outputs he uses the pseudonym alva noto. With a strong adherence to reductionism he leads his sound experiments into the field of electronic music creating his own code of signs, acoustics and visual symbols. Together with Olaf Bender and Frank Bretschneider he is co-founder of the label 'Raster-Noton. Archiv für Ton und Nichtton'. Diverse musical projects include remarkable collaborations with Ryuichi Sakamoto, Ryoji Ikeda (cyclo. ), Blixa Bargeld or Mika Vainio. Nicolai toured extensively as alva noto through Europe, Asia, South America and the US. Among others, he performed at the Solomon R. Guggenheim museum in New York, the San Francisco Museum of Modern Art, Centre Pompidou in Paris and Tate Modern in London. Most recently Nicolai scored the music for Alejandro González Iñárritu’s newest film, 'The Revenant' which has been nominated for a Golden Globe, BAFTA, and critics choice award. Nam June Paik (1932–2006), internationally recognized as the "Father of Video Art," created a large body of work including video sculptures, installations, performances, videotapes and television productions. He had a global presence and influence, and his innovative art and visionary ideas continue to inspire a new generation of artists. ZHANG Ga is artistic director of Chronus Art Center and an internationally recognized media art curator. He is Distinguished Professor at China Central Academy of Fine Arts. Previously, he was a Professor at the Academy of Arts and Design, Tsinghua University, and Associate Professor of Media Art at Parsons School of Design, and has held visiting positions at the MIT Media Lab, Stanford University, University of California Santa Barbara, and The Graduate Center, CUNY. 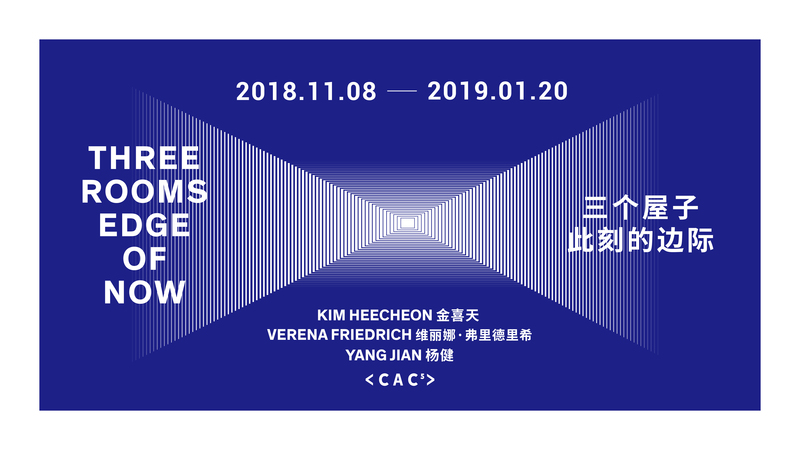 In his capacity as Consulting Curator of Media Art at the National Art Museum of China from 2007–2014, he curated the widely acclaimed international media art triennial series including Synthetic Times (2008); Translife (2011), and thingworld (2014), among others. These large-scale exhibitions critically investigated and examined global media art trends, and generated intellectual discourses about art, technology and culture. He served on the juries for Prix Ars Electronica, VIDA, and Franklinfurnace’s Future of the Present Award, to name a few. He has spoken widely on media art and culture around the world and has edited several books and authored essays that were published by the MIT Press, October, Liverpool University Press and Tsinghua University Press. He currently serves on the editorial board of Leonardo Books, published by the MIT Press. For detailed Information about the A&T@ program.